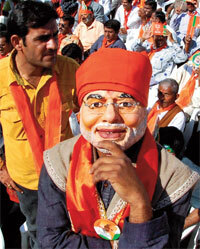 Gujarat Chief Minister Narendra Modi is a highly polarising political entity. Whether he speaks on nationalism or nutrition, he stirs debates. His interview to an international business newspaper, in which he attributed high malnutrition rate in his state to beauty-conscious, middle-class girls, has attracted expected reactions. Modi has been obsessively hawking his state’s growth model and his track record in development. Washing his hands of the state’s worst kept secret—malnutrition—he has attributed the problem to a group of population which has suffered the scourge the most. Like other less developed states, Chhattisgarh and Odisha, Gujarat has been fighting malnutrition among children. Modi’s surmise that the state’s middle class is so dominant that its dieting girls contribute to the overall poor malnutrition rate is illogical. The state has a huge rural population (57.4 per cent), high rural poverty (39 per cent rural households are poor, while 20 per cent in urban areas are poor) and its human development indicators are worse than that of Odisha and Chhattisgarh. Malnutrition causes more than one-third of deaths among children under the age of five in Gujarat. In more than 50 per cent of the state’s districts, about 60 per cent children are underweight. In 75 per cent of tribal-dominated districts, about 45 per cent children are underweight. According to India Human Development Report of 2011, 55 per cent of women in Gujarat suffer from anaemia. And not all of them belong to the middle class or the high consuming class. Modi’s argument can be logical only if the state picked up an organised habit of crafting well shaped girls by making them starve right from birth or mothers while expecting. According to the National Sample Survey Organisation (NSSO), about three per cent of the state’s urban population has a monthly per capita expenditure of more than Rs 2,540—the highest spending category. Gujarat has secured 13th position in the hunger index for the country’s major states. This puts the state behind Odisha, Uttar Pradesh, West Bengal and Assam, known for widespread poverty and malnutrition. In another NSSO finding, rural households in Gujarat spend close to 58 per cent of their monthly expenditure on food, while urban households spend 46 per cent. This indicates that people are spending more on food, and that expecting mothers and children have been on inadequate diets, leading to high adult malnutrition. But that is not because of what Modi says; it is due to a bad development model. Decades of child malnutrition have led to a generation of malnourished adults. Gujarat realised the ills of malnutrition decades ago. It struggled hard to bring down infant and maternal mortality. Ahmedabad was arguably the country’s first city to have a nutrition mission, started by Mahatma Gandhi in 1924. His arguments on malnutrition and high infant mortality are still valid: poverty results in inadequate food for expecting mothers and children, besides lack of focus of the government on the issue. It is difficult to find out what happened to that mission or any government programme of that lineage. But the state implements all the national programmes that target malnutrition. Accepting Modi’s claims of good governance, those programmes should have had positive impacts. But the available data points at the paradox that one of the fastest growing states has, in fact, not been able to fight malnutrition. India has a history of politicians in power giving excuses to justify lack of governance. This affects the development agenda; it degrades an issue’s seriousness which, in turn, keeps it out of overall governance priority. In January this year the prime minister called malnutrition a national shame. Many celebrated the statement, thinking nutrition is back to being a national priority. But Modi, a prime minister aspirant, trivialised the issue to an extent that fashion magazines have started writing on how to avoid malnutrition while being in shape.